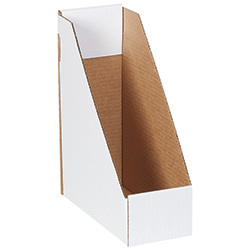 These cartons were designed to keep printed media neatly organized. One piece box folds together in seconds without tape or glue. Front panel has ample room to label with content identification. - Inside dimensions are 9 1/4" x 4" x 12". - Manufactured from 200#/ECT-32 B flute corrugated. - Sold and shipped flat in bundle quantities.